JANE: Any discussion of Diana Wynne Jones’ work would not be complete without a mention of her “Chrestomanci” books. I hesitate to call them a “series,” since the term implies events occurring in order and these most certainly do not. Or they do, sort of… I mean, Charmed Life is usually listed as the first of the “Chrestomanci” novels, but as I see it both The Lives of Christopher Chant and Conrad’s Fate would come first, chronologically. ALAN: Well, the stories do take place in parallel universes, which would explain why the “events” take place “out of order,” as it were. It’s actually quite hard to arrange the books chronologically – there are always things that seem not to fit. Consequently my preference is to read the books in the order that they were published. After all, that’s the order in which Diana Wynne Jones first encountered the material, and what could be more definitive than that? JANE: That’s as good a solution as any! One thing I like about the “Chrestomanci” books is that often the Chrestomanci is a very minor character. Just because there is someone whose job it is to police the uses and abuses of magic does not mean that the main characters are not important. Far from it. For this reason, I really like both Witch Week and The Magicians of Caprona. ALAN: Most of Diana Wynne Jones’ books stand alone, though occasionally she did write a sequel to some of her stories. There are two “Magid” novels, for example: Deep Secret and The Merlin Conspiracy. So the seven books that make up the Chrestomanci series are therefore a little untypical of her work. She did write one other extended series. The four novels known as the Dalemark Quartet are the closest things she ever wrote to a standard fantasy story. Because they are so close to the mainstream of fantasy, of necessity they lack the quirkiness and humour that was her trademark. Probably because of this, I’ve never liked them very much. JANE: Perhaps because I’ve never expected Diana Wynne Jones to just be a quirky writer, I had no problem at all with the Dalemark Quartet. I also don’t have your resistance to “standard fantasy,” although I do insist that it be both well-written and non-formulaic. And I really feel the Dalemark Quartet is worth reading. The characters come from a wide variety of backgrounds and the problems they face are complex – well beyond the usual clichéd beat the Great Evil Lord of Darkness gakk that you rightly have termed EFP (Extruded Fantasy Product). Therefore, I’ll go counter to you and recommend the Dalemark Quartet to anyone who doesn’t start out with a bias against Fantasy or a desire to limit the author to one sort of book. ALAN: Oh I agree! They are certainly complex and clever novels, but they just aren’t my particular cup of tea. JANE: Although I really liked the Dalemark Quartet, I strongly believe that Diana Wynne Jones herself shared your dislike of EFP. Certainly, her novel The Darklord of Derkholm takes every single trope of that sort of fantasy to task. Have you read it? ALAN: Oh indeed I have! The story is set in a fantasy world that is dominated by its tourist industry. Mr. Chesney’s Pilgrim Parties arranges annual tours from our world to the fantasy world and the tourists expect to see all the fantasy clichés on their holiday – a dark lord, wise wizards, and so on. Everybody always puts on a good show for the tourists and the tourists always leave quite satisfied with their experiences. But the effect can be quite devastating on the people who live in the fantasy world. JANE: Again, what saves this from being simply a snarky attack fantasy fiction clichés is that Diana Wynne Jones makes her characters very three-dimensional. Derk is an excellent wizard, in many ways, but Querida is right. He’d make a terrible Dark Lord. Querida makes matters worse by creating a rift between Derk and his wife (who is also a wizard). I don’t want to provide spoilers, but one of Diana Wynne Jones’s greatest talents is the passing comment that makes even the most outrageous fantasy world real. In this case, it’s a comment that wizards have a very high rate of divorce. Suddenly, the problems between Derk and his wife seem all too real and divorce all too possible. ALAN: Yes – it’s these little human touches that anchor her stories in reality and make the world feel lived in, no matter how bizarre it may appear to our mundane point of view. 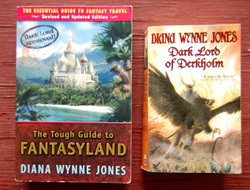 I have always considered The Dark Lord of Derkholm to be the fictional counterpoint to Jones’ delightfully barbed The Tough Guide To Fantasyland. This is a travel guide to a standard fantasy landscape. In a series of short satirical definitions arranged in an authoritative A-Z , she describes all the obligatory facets of a fantasy adventure. For example there will be STEW which will be thick and savoury (i.e. viscous and dark brown). There will be BEER which foams and is invariably delivered in tankards. It will be bought at an INN which will be made mostly of wood and which will be larger upstairs than downstairs. Downstairs, there is room only for a taproom and bar (and maybe a kitchen where STEW will be cooked). Upstairs there are innumerable sleeping chambers (not bedrooms) arranged along never-ending corridors so that people can creep through them and break in to search luggage or threaten the occupants with DAGGERS. And, yes, stew does seem like an odd choice for a staple food, but since it also can, well, “stew” for a long time, stew makes perfect sense for a low-budget dish in an inn or tavern, because a pot can be kept warm on the hob and served up quickly to newly arriving guests. However, it’s a lousy choice when camping out, yet many writers don’t make the distinction. ALAN: Perhaps the writers have never tried to cook anything over a camp fire. JANE: Oh… yes! Good point. There’s something to be said for building upon actual experience. Another great entry for the prospective world-builder is the one on embroidery. ALAN: The definitions are trite in themselves but taken together they amount to a devastating destruction of the fantasy cliché, and if you have ever read any of those horrible novels, you will laugh in delighted recognition at her witticisms and truisms. And, as an added bonus, you will know exactly how not to write a fantasy novel. JANE: I firmly agree! One can write in the context of a tradition – such as High Fantasy – without falling into the worst errors. I keep thinking of things I want to add, but reality is knocking at my door, in the form of reminders that I really DO need to get some fiction writing of my own done. Shall we continue next time? This entry was posted on April 16, 2015 at 1:00 am and is filed under Thursday Tangents. You can follow any responses to this entry through the RSS 2.0 feed. You can leave a response, or trackback from your own site. I’ll admit, to my shame, that the only one of her books I’ve read is The Tough Guide To Fantasyland, and I dearly love it. The copy in my local library is shelved in the teen’s fantasy section near Harry Potter. I’m not sure whether that’s because she’s considered a YA author and the librarians are clueless, or because the librarians are subversively smart. Either could be true. Still, I got annoyed looks from kids and parents when I went into that section to get the copy off the shelf. Gotta love this place. I have to take exception to your denigration of STEW. It is, in fact, the only feasible means of consuming the sorts of foodstuffs – from which fresh vegetables are indeed notably absent – that can be packed along in adequate quantities on a prolonged Quest. Not to mention a good 90+% of the things that you are likely to be able to acquire along the way [many of which are probably better not mentioned]. Sure, it takes a while to cook – but, like any intelligent trapper or voyageur, you eat it for _breakfast_. After breaking camp, normally. Thanks for acquainting me with this writer. There are so many good ones with whom I haven’t caught up even yet. You aren’t alone. I’ve been reading ones that either I missed or I couldn’t bear not to re-read!